It was more irritating than anything else. 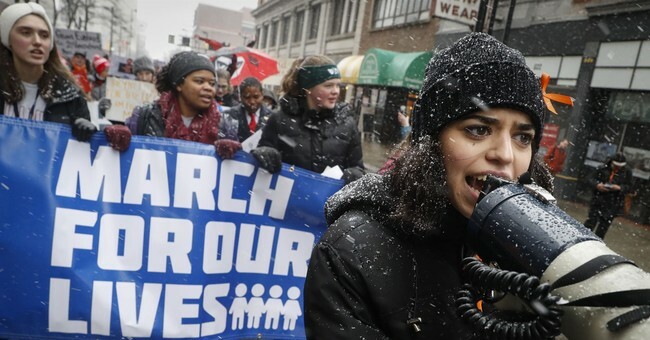 The virtue signaling over one’s disagreement with “A March For Our Lives” reached fever pitch with the culmination of Saturday’s event. Yet a trend across social media seemed to be playing out. If someone criticized David Hogg, Alex Wind, or Emma Gonzales there was an immediate lashing out in response. These teens and two of their comrades appear on this week’s cover of TIME magazine. Two weeks ago they traveled to Dubai to be part of an international symposium on education. They have sucked up nearly every available second of possible air time on CNN & MSNBC (while obviously avoiding actual journalism.) They’ve also had ample amounts of cash and exposure thrown their way. Saturday’s march was to be the pinnacle of this outrage movement that has largely been propped up by false pretense. These young people—immediately thrown into one of the most manipulated controversies of our time—are angry, opportunistic and—just a month after their classmates were needlessly lost—now instant celebrities. Even though first year grad school students have literally multiple times the actual knowledge on the issues pertaining to the social science of guns, their effects, and the good and bad attributed to their owners, the lazy media continue to treat these five kids as though they have PHD’s. If anyone questions it, the virtue signaling begins. Instead Hogg and his belligerent band of media hyped know-nothings spout their misunderstood self-researched “facts,” lead chants of “enough is enough,” and then play the untouchables when someone calls them on their inaccuracies. It is not a “personal attack” on these kids to say that they are “misinformed, arrogant, and misguided.” It’s a statement of fact. And the moment they accepted a litany of interviews for CNN their ideas became fair game. It is certainly the opposite of “personal attacks" if the policies they are trying to gather steam for (banning of certain types of instruments, advocating for ages of legality, all while mix-minusing the moral question) are ones that will put more children (like mine) at greater risk in years to come. You don’t get to use your victimization (as real as it was) to advocate for an even less safe school for my children. The truth is Saturday’s “historic” and “record breaking” march had barely more in turn out than some annual marches held in Washington every year. For instance the (not to be confused by its much longer standing moniker) “March For Life” turns out a crowd roughly the same size in DC every January and has since 1974. Technically that’s millions more marchers and mostly silence from media. The DC police refused to release numbers on Saturday, but the Washington Metro only reported a slight bump in usage, where in 2017 with the “Women’s March” they reported a more than doubling of normal Saturday Metro usage. We adults who see these kids' earnestness have allowed them time to (if they so wished) mourn in private. Many of their fellow classmates at Marjory Stoneman Douglas High School strongly disagree with everything the “fab five” (as they’ve been coined on twitter) are up to. One quite articulate kid, Kyle Kashuv, was specifically targeted and banned from participating because his ideas didn’t line up with the overly emotive and misguided memes the others have been advancing. These are kids who should be granted all the room in the world to grieve, mourn, and get good counsel. Or they are public opinion shapers who are ready to defend what they believe. The money wasted on the spectacle in Washington should have gone to simple ideas like metal detectors, personnel, training and certification for our schools to handle threats as they appear. Saturday saved no one, helped no one, and only served to further the false notion that these kids should be doing homework instead of being treated like Nobel nominees. Lastly, let’s also be done with all the “moral high ground” positioning. Hogg reminded everyone on Saturday that the hashtag for their cause is #NotOneMore. He then cited 96 gun deaths per day in America (not just of kids but of gun users of all ages.) Meanwhile in abortion clinics across America each day (according to the Guttmacher Institute - the research propaganda machine for Planned Parenthood) 2635 children’s lives are ended due to legal abortion. The moral dissonance is deafening. The slogan is hypocritical. The icons are babies. It’s time to stop manipulating them, allow them to finish their high school experience, and address the real issues.